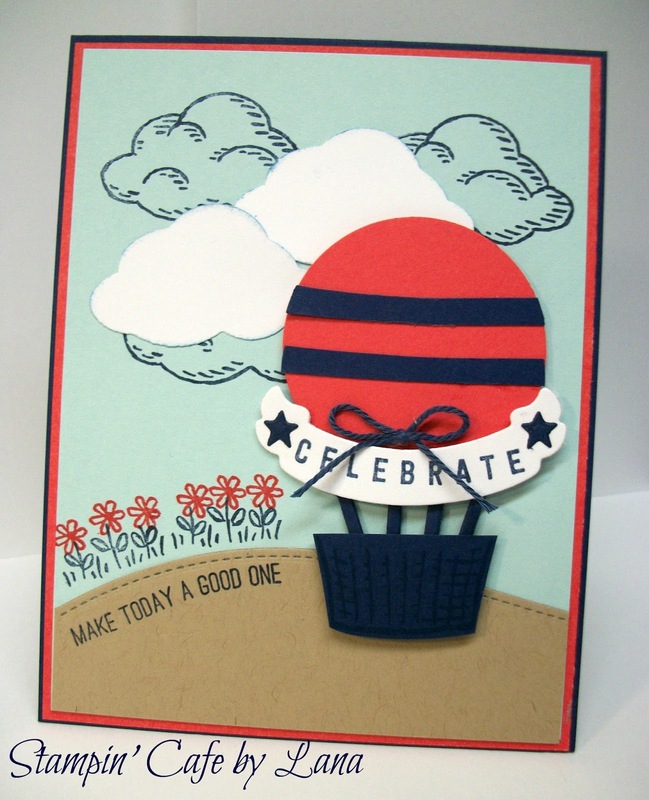 I made this hot air balloon card using the Sprinkles of Life stamp set by Stampin' Up and a circle punch! The card is 4-1/4 x 5-1/2 inches, top folding. I used navy as my card base, adding a layer of coral cut 1/8 inch less than the card base, and adding the blue layer cut 1/8 inch less than that layer. I stamped the background clouds in navy using the Sprinkles of Life stamp set by Stampin' Up and punched out the white clouds using the Tree Builder Punch that coordinates with the Sprinkles of Life stamp set, also Stampin' Up. To make the hot air balloon basket, I stamped the basket onto navy cardstock and cut it out by hand. I then attached four thin strips of navy cardstock to the back of the basket. I punched out a 2 inch circle in coral, adding the navy stripes with strips of navy cardstock. (To get the stripes, I punched out another circle in navy and handcut the strips to fit the coral circle, but you could also stamp stripes or a design.) I then attached the circle or "balloon" to the strips of cardstock I had already attached to the basket. I added the banner using a die cut and stamped the word "Celebrate" on it, and added some die cut stars to the ends of the banner. I added a small baker's twine bow in navy. The "ground" piece is cut with a die by Lawn Fawn called Stitched Hillside Borders. After attaching this little curved "ground" piece, I stamped some small flowers up the hill using the flowers from the same Sprinkles of Life stamp set. The greeting "Make today a good one" is from a previous Paper Pumpkin kit from August 2014 called Seriously Amazing. 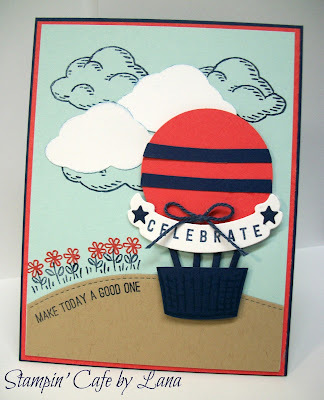 The "Celebrate" greeting is from the Any Occasion stamp set by Stampin' Up (Sale-A-Bration). The banner and stars are die cuts from the Sissix die set by Rachael Bright. Make today a good one! Up, up and away!